CHEAP coal and easy availability of water may have spurred rapid industrial growth in Sonebhadra district of Uttar Pradesh. But the nine coal-fired power plants, clustered along the Renu river, are poisoning the air and water in the district with mercury, a neurotoxin. 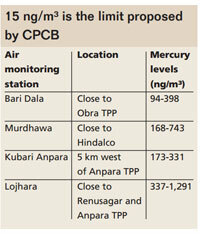 A recent study by research scientists with the non-profit People’s Science Institute in Dehradun found mercury levels in the air near these power plants ranged from 94 ng/m3 to 1,291 ng/m3. This is far above the (yet-to-be-notified) permissible limit for the toxin proposed by the Central Pollution Control Board—15ng/m3. 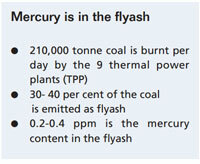 The toxin is in the flyash (residue from burnt coal) that escapes into the air through the chimneys or gets discharged as effluent into the Renu, a tributary of the Sone river, said lead researcher Anil Gautam. The study was conducted between February and April this year. A boost in coal production and use of coal with higher mercury content are the main reasons for increase in toxin levels in the air and water,” said Ramesh Tripathy, Gautam’s co-researcher. The effluents from these plants have killed all aquatic life in the river, he added. Besides brain damage, mercury causes skin allergies, kidney and lung diseases and cancer. But its effect on the health of over five lakh people living near the power plants has not been studied in the last decade. Lucknow’s Indian Institute of Toxicology Research gave some indications in 1998-99. It found that mercury in the hair and blood samples of people living close to the thermal plants was 300 times higher than in people living 300 km away in Patna. Their IQ levels were also below average, said Brahmajeet Singh of non-profit Vanvasi Seva Ashram. Power matters, not pollution The thermal plants in Sonebhadra together generate 14,150 MW of electricity (10 per cent of total power generated in India). The emissions from the plants are far above the figures projected 20 years ago by a consultancy firm asked to assess the carrying capacity of the region. Five more thermal plants are in the offing. They will increase the power generation capacity of the region to 24,350 MW. A visit near the state-owned Obra thermal plant in Chopan block showed flyash from the plant is directly discharged into the river. The precipitators in the chimneys that filter the flyash are also out of order, increasing toxins in the air, said Tripathy. The response of D N Bajpai, the chief general manager of the Obra plant, was why bother about pollution as long as you get electricity”. Bajpai, however, added things would be set right in the next three years. The Renu river, passing by the Obra plant, has a thick silt of grey settled along the banks. 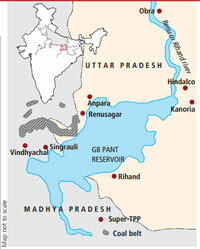 The Rihand reservoir downstream is equally polluted which means flyash is directly dumped into the river or leaches into it from the flyash ponds, said Brahmajeet Singh. The study also found high levels of mercury in industrial effluents. The wastewater in the Dongiya drain that flows by the Kanoria Chemicals (caustic soda manufacturing unit), for instance, had 15.3 μg/l mercury against the permissible limit of 10μg/litre. The drain discharges effluents directly into the Renu river. Drinking water a problem The pollution is affecting the people nearby. Villagers of Tharpathar, located behind Hindalco plant owned by the Birla Group in Renukoot, said 100 heads of cattle have died in the past two years after drinking wastewater from the aluminium plant. 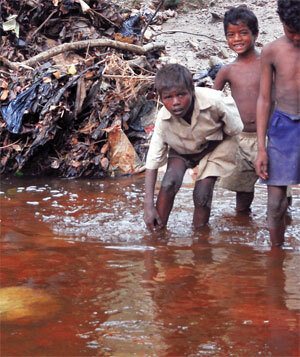 The wastewater flows through a drain into Renu river. Ram Subhag, 35-year-old labourer, said his family of five have sores all over their skin. Many children in the village could be seen with skin sores and spots. They fetch drinking water from downstream where the river is a little less polluted; they cannot drink the groundwater as it has flourides.